Asanas to strenghten, clean and clear the physical body.They work on the nervous and glandular system and integrates the right and left side of our body and brain. The asanas harmonize the whole body system. Pranayama to energize the body and to clear and clean the energy body. Pranayama recharges the whole system with prana, life energy, that the divine light can easily flow through the whole body system. Meditation which deepens the experience of the kriya, balances and regenerate the soul, the mind and the body. It supports healing, harmony and transformation. There are different meditations for different parts and challenges in our life. Simran balances the whole body system. 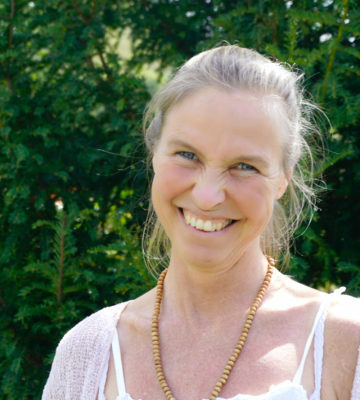 She works with the body by touch to release blocks and pain in the physical body, with the Aura to heal the shocks and trauma which are hold in the energy system and with the healing sound of a monochord to balance and harmonize the whole system, that the divine light can flow and regenerate the body, the soul and the mind. Inner blocks can be released with love. Simran holds with her purity and love a deep healing space, that unity with the divine light and the flow of the divine light through the whole system, can be felt. This includes a deep healing and transformation process to our essence, to that what we are essentially, love and light, our true nature.